18th century elegance, 21st century engineering. Easy-care woodgrain laminate with traditional edge detail. Three shelves, two adjustable. Wire management grommet in back panel. 18th century elegance, 21st century engineering. Traditional styling combined with thoroughly modern, easy-care laminate. 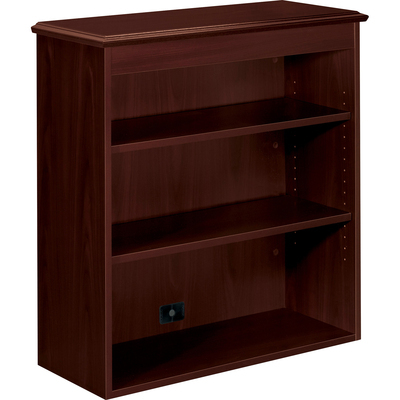 Three shelves hold books, binders and supplies; two shelves adjust in 1 1/4" increments for storage flexibility. Convenient cord management grommet in back panel.